My mom had designed and was making a quilt for my niece’s 5th birthday. This is a tradition she started with my son, Nicholas, who is her first grandchild. There are now six grandchildren ages 5 to 24. Mom made each of them a baby quilt when they were born. Then she made (or will make) them another quilt on their 5th, 10th, and 15th birthdays. Each grandchild gives her ideas or a theme for the quilt and my mom works her quilting magic to create a work of art that is loved and used by that grandchild. What was causing me such a problem was the quilt for Emily, my niece, and the youngest grandchild. She told her grandma (my mom) she wanted cats, fish, fairies, princesses, and purple in her quilt. After she heard Emily’s wishes for her 5-year quilt, my mom conceived of a design that included everything Emily wanted. That is correct. 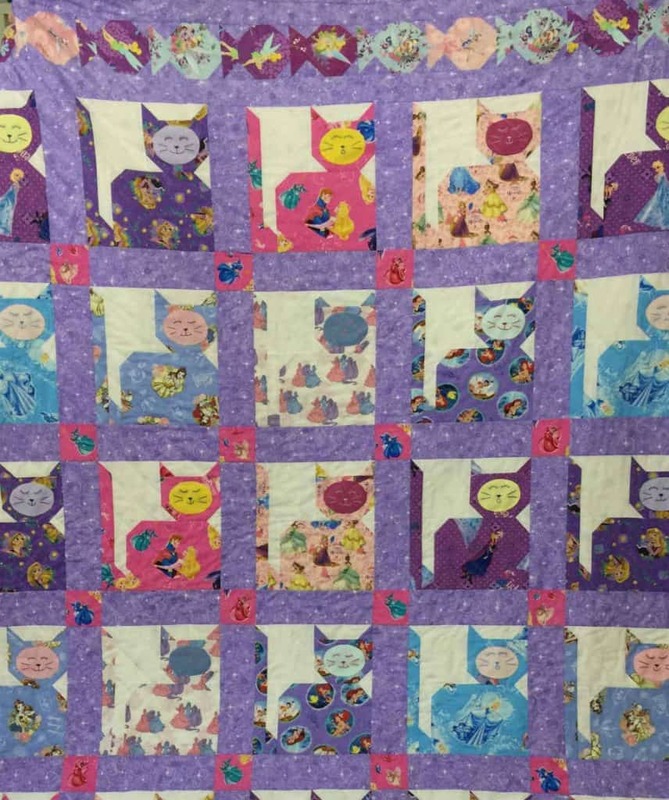 Emily’s quilt has cats, fish, fairies, princesses and purple! 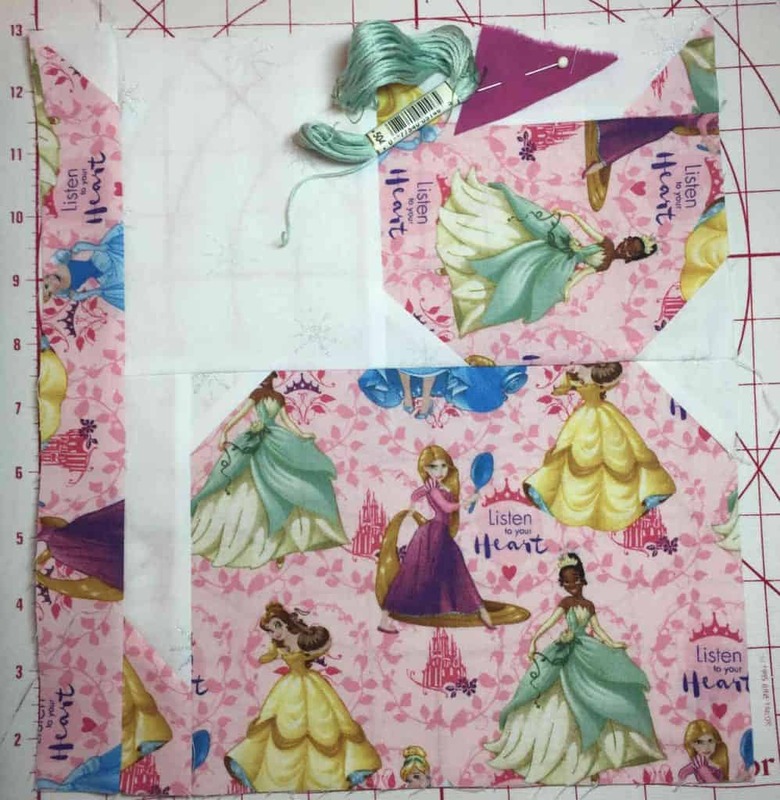 One of the ways my mom was able to include Emily’s favorite things in her quilt was to use Disney princess fabric and make machine-pieced cat blocks. Mom wanted the cats to have faces and she came up with several options to make them. 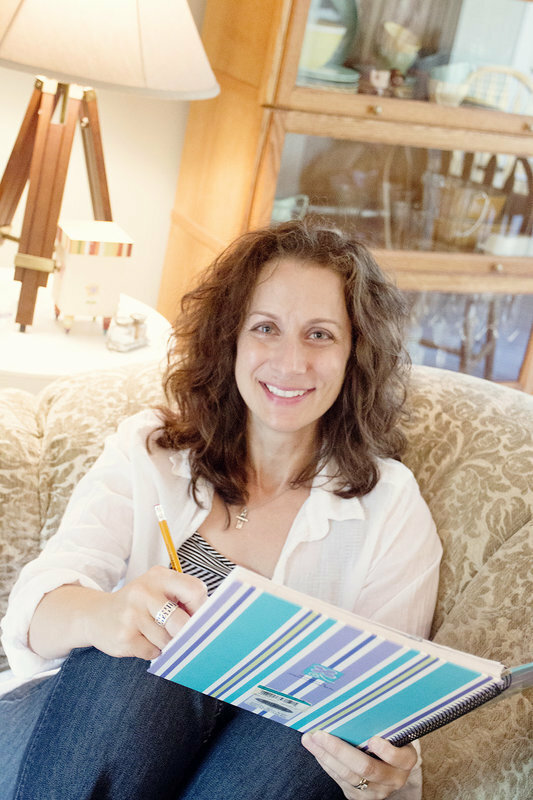 One of her ideas was to use solid colors to coordinate with each Disney princess fabric. 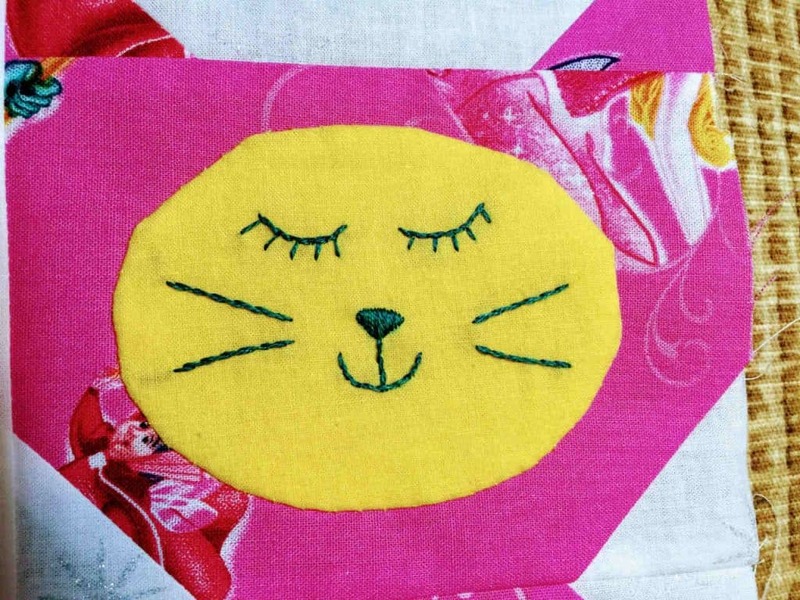 The faces would be embroidered on the fabric, cut into ovals, then appliqued on the cat blocks. This cat block features many Disney princesses. The face will be cut from the solid purplish fabric. (See the swatch above the cat head?) The facial features will be stitched with coordinating green thread. My mom loves putting fabrics together and machine piecing. These are some of her favorite parts of quilting. Though she has the skill, she doesn’t like to spend time doing handwork. On the other hand, I really enjoy handwork. It relaxes me and is something I can do when I am watching TV. So, I volunteered to embroider the faces on the coordinating fabric. Mom quickly took me up on my offer. She needed to make 32 cat blocks for the quilt. There were 8 different Disney princess fabrics so she was making 4 cats out of each fabric. 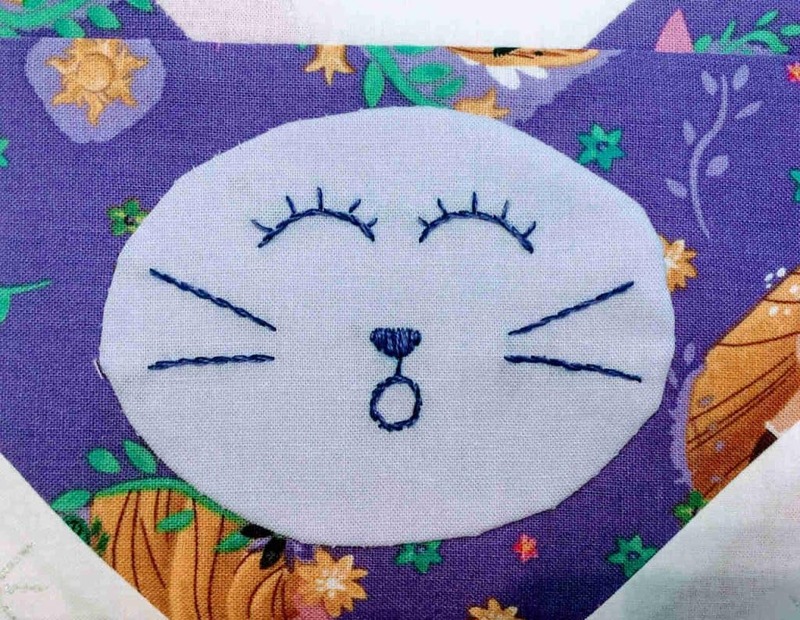 As a result, there would be 32 cat faces to embroider. I sketched 4 different faces and traced them on the solid colors that coordinated with each of the Disney princess fabrics. It didn’t take me too long to do all 32 faces. Once they were finished, I thought I was done helping my mom. However, a few days later we were talking about the progress on Emily’s quilt. While I had been stitching the faces, Mom had been working on fussy cutting Disney fairy fabrics to machine piece the fish (Another way she was getting all of Emily’s favorite things in her quilt.) These blocks were smaller than the cat blocks and she needed to make 62 of them. 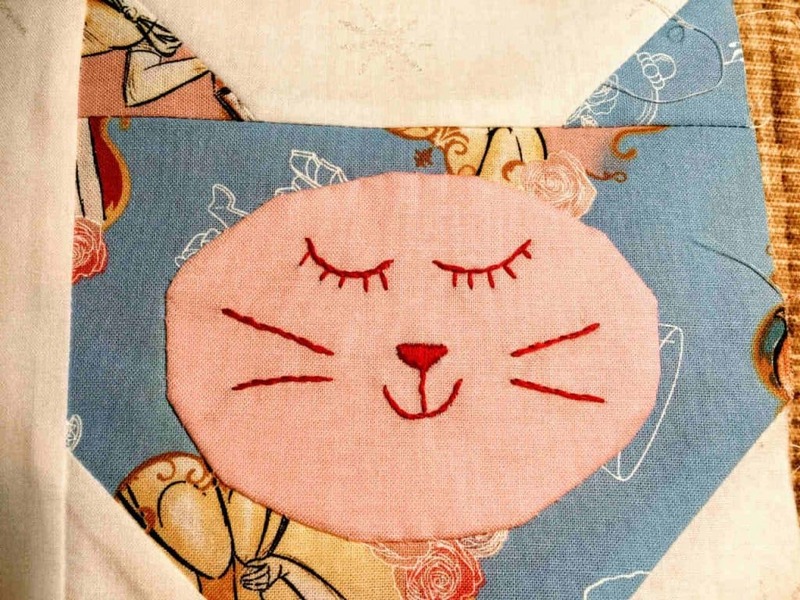 Still on her to-do list was machine appliqueing the cat faces I had embroidered. However, she wanted to turn the edges of the ovals under so there wasn’t an exposed raw edge. This would need to be done by hand before she could applique them with her machine. Mom still had a lot of work to do! Hand applique is another hobby that relaxes me and I can do when watching TV. I offered to applique the faces on the cats using a needle-turning technique. Mom gratefully took me up on my offer so she could focus on the fish blocks. 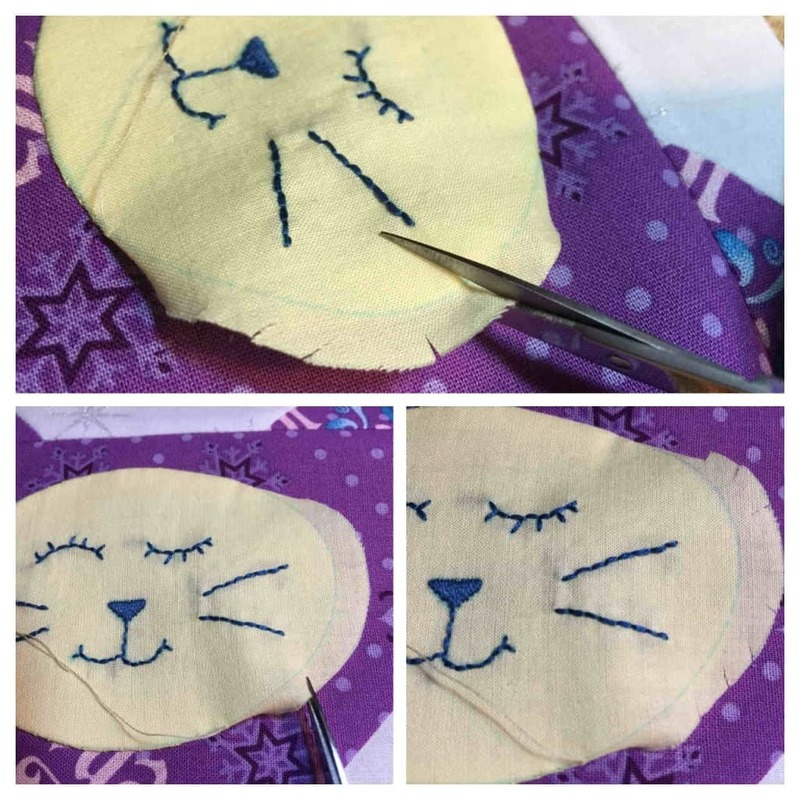 I had just finished appliqueing the first cat face on the Disney princess fabric using needle-turning. While the bottom of the oval was nicely curved, the top half of the oval had multiple angles along the edge. The angles along the top edge was NOT the look I was going for! My first thought was I was just rusty. It had been a while since I had appliqued curved edges. I appliqued another face and took my time on the end curves but I got the same disappointing results. Still thinking I only needed a little more practice, I attached a couple more faces. These weren’t any better than the first two I had done. First, the seam allowance was about a quarter of an inch or slightly smaller on the ovals. This was about how wide it needed to be for me to work with it and turn it under with my needle. Second, I had focused carefully when turning the fabric on the curved edge and even took smaller stitches on the sharper curves. This resulted in angles with straight edges between them. The width of the seam allowance and the size of the stitches can affect the edge of an appliqued piece but it seemed like there was something else I should be doing. 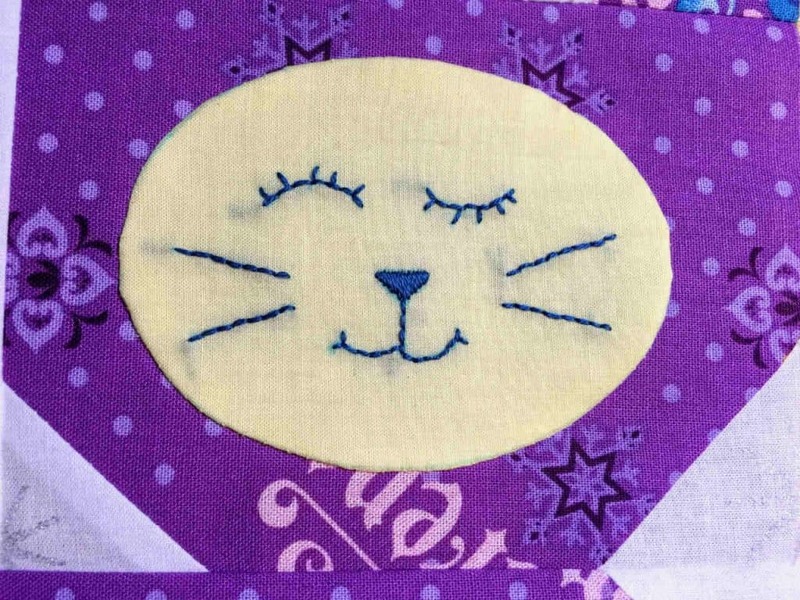 I tried needle-turning another cat face. I noticed the fabric in the seam allowance was folding over on itself on the more prominent curves making points instead of the smooth curve I wanted. My mind went back to the first applique class I had taken years ago when the instructor had us sew down a heart. She explained a heart was the best shape to learn applique because it has inside and outside points as well as curved and straight edges. An image of a heart formed in my mind and I remembered she had us make small cuts along the curve to help it turn under and lay down flat resulting in a smooth edge. With this new plan in mind, on the next face, I cut along the curved edge before turning and appliqueing it down. The results were better but still not entirely smooth. Again, I thought practice would make perfect. So I decided to do a few more faces thinking they would get better. And again, there wasn’t much improvement. I reasoned the problem wasn’t with the length of the clips I put in the curve. If I made the snips any longer they would be seen when I turned the seam allowance under and there would be tiny holes around the finished edge. The only other change I could think of was to adjust the angle of the snips. I had been cutting all the small slits perpendicular with the oval’s edge. So, I tried cutting most of the slits at a diagonal. A few snips were perpendicular to the edge but most were at a diagonal. I continued to clip the seam allowance and needle-turn around the rest of the oval. The results were almost perfect and I was thrilled! Using the same clip-and-turn technique on the remaining faces resulted in seam allowances that turned easily and laid down smoothly! Unfortunately, I had finished almost half of the cat faces before I was consistently producing smooth edges all the way around the ovals. Many of the 32 cat faces have various levels of less than smooth edges. However, I decided not to pull them apart and redo them. I was concerned that removing the appliqued faces, recutting at a diagonal, and needle-turning again would produce an overworked seam allowance resulting in tattered looking edges. Mom assured me with 32 cats blocks and 62 fish blocks made out of Disney princess and fairy fabrics along with sparkly purple sashing, Emily would love her quilt and wouldn’t notice wonky edges on some of the cat faces. This is only part of the quilt my mom designed and created for my niece. Use a water-soluble fabric pen to mark what will be the edge of the oval. This’ll give you a specific line for needle-turning and is easy to remove. Use no wider than a ¼ inch seam allowance. The wider the seam allowance, the more fabric there is to ease in the curve. So, less is better. Before clipping any curves, attach the oval to the fabric where the curve is shallow. Execute some stitches to attach the oval to the fabric. For a better, more controlled cut, use the back of the scissors to snip the fabric, not the tip. Be careful not to cut to the line that marks the edge. Use smaller stitches that are closer together on the curves.